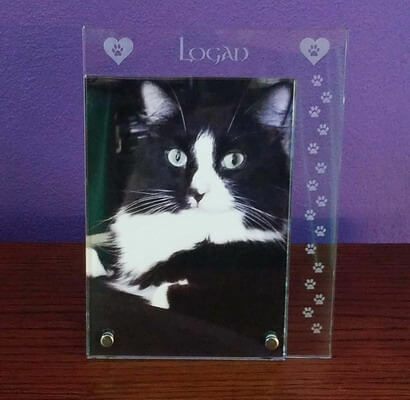 This beautiful frame holds a 5x7 picture of your beloved cat. This frame can be customized with your cat's name. Remember your pet for years to come even after they've crossed over the Rainbow Bridge. We can replace dog with cat if you like, just let us know! 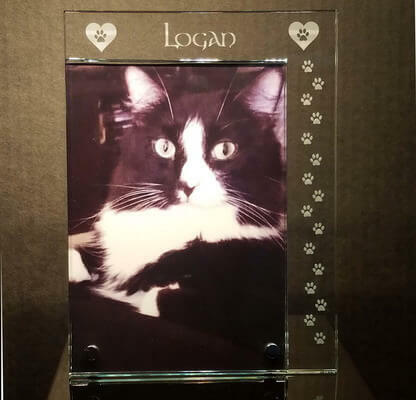 The frame is engraved with paw prints and your cat's name. You can completely customize this frame with different quotes - just let us know what you'd like! You can leave your instructions in the comments box - let us know if you'd like to see a proof before I start your glass. This frame comes with a gift box and silver pin to display the frame.